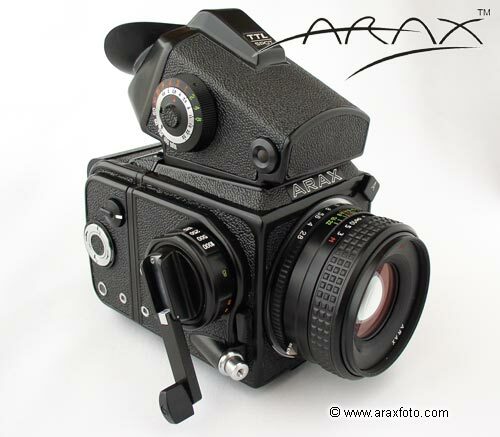 Kiev-88/CM camera upgrading process by ARAX company. 1. A rebuild and upgrade of the shutter mechanism improves reliability and guarantees a much longer life span. 2. This rebuild and adjustment of the shutter mechanism results in precise shutter operation and the most accurate exposures. 3. The Pentacon Six breech-lock lens mount has been redesigned and upgraded. To fit to all Kiev and CZJ lenses. The original factory has problems with several lenses. 4. The installation of a Mirror Lock-up system (MLU) system which operates independently of the shutter release mechanism. MLU function eliminates any vibration caused by the mirror movement when doing macro photography or when working with long focal length lenses. 5. The ARAX camera is treated with a light absorbent internal coating, preventing any external light or flare, resulting in excellent image contrast. 6. The upgrade to a special durable, non-reflective black external finish (the original chrome finish is removed by a precision sand blasting process, and then a special new black finish is applied) make the ARAX-CM camera both durable and attractive. 7. The reassembly and adjustment of the film advance mechanism and examination for accurate frame spacing gives the ARAX-CM its smooth film advance. 8. We examine each film magazine for any light leaks. 9. The calibration of the camera body and the magazine working distance is done as well as the relative positions for both the body and magazine to assure interchangeability. 10. We check all lenses for alignment, sharpness, aperture operation, and make sure they have a correct infinity focus. 11. Our technicians disassemble the prism viewfinder, and eliminate any manufacturing defects. 12. Examination of the light metering controls takes place as well as various other adjustments of the prism viewfinders. 13. A professional camera inspection for full functionality is performed including a compatibility test with various German CZJ lenses. All of this hard work yields a new GEM of a camera, with a reliable and accurate shutter mechanism, and silky smooth operation. Add the most reliable lens mount, the most accurate metering, and the brightest viewfinder on the market to the new spectacular look of the camera and you know you are using the BEST KIEV available!